The Flottebo is a couch, remove the pillows and it becomes a bed. I cheated a bit and actually went into Ikea to look at this before I bought it. Don’t worry, I still bought it online. I love the way that Ikea does the flat packing thing, so all of the components for the Flottebo come in 4 boxes. One weighs around 100 pounds, so I opted not to squeeze it all in my car. Plus the intent of this blog is to see if I can find the best couch while shopping from my own couch, or floor since I currently don’t have one. They promised 6 day shipping so let’s see if they can keep their end of the bargain. What attracted me to the Flottebo is that it doubles as a sleeper. I got to try it at the store, and was a bit shocked that the triangular shapped pillow back stoppers don’t roll. I really won’t know if I can use it as a sleeper until I get the chance to sleep test it. Also, I won’t know how well the pillow stops keep me and my family from falling off the back of the couch until I really put that to the test. I also bought the cute little side table that sticks out from the side, and I love it. You can only put about 35 pounds on it, so make sure that nobody sits on it. It’s an IKEA product so you know you will have to assemble it. 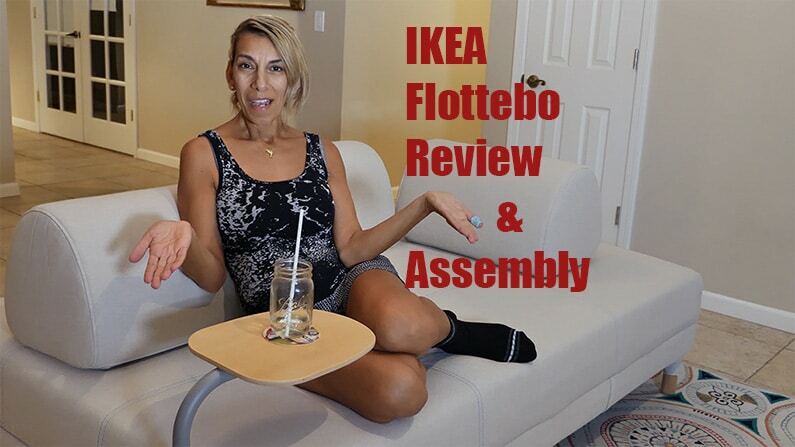 In my video above, I discuss the things that I like about my Ikea Flottebo sleeper sofa. After my review of it, I have an assembly tutorial and I’ll share some tips with you. It took me 4 hours to assemble and shoot the video, it should take you much less time, as you probably won’t be shooting a video while putting it together. It screams of day bed, when you remove the couch pillows, it becomes a bed. The couch is a mix of particleboard and plywood. The mattress is made from a fairly dense, 2 lb/cu.ft polyurethane foam. This is the type of foam that you would usually see at the foundation of a mattress. It has a steel pocket spring unit. When you lift up the unit you will see a mesh screen that can be used to hold sheets and a couple of pillows. It is really heavy, so it will take 2 people to flip it over or carry it. Who Should Buy a Flottebo? This couch will double as a bed for the days when you just can’t drag yourself off the couch, or if you have guests. The ideal purchaser is one who is either just starting out, think first apartment, or for a guest bedroom, if it doesn’t have room for a queen sized bed. At this price and the shipping/ease of moving it I could see this couch making the move from apartment to apartment, up and down stairs etc. It is likely too small for the main couch of a family; however, I could see it getting a good deal of use in a child’s bedroom. A teen or preteen may be able to use this as a daybed/sleeper. This would really open up a room for tons of activities. How do I Assemble a Flottebo? It took me 4 hours (including the side table), but to be fair it just takes longer to shoot a video. Plus I made a HUGE mistake or two along the way. I was able to do just about everything by myself. I needed help lining up the lift gate portion, and flipping it over to install the side table. Seriously, if you see an X on a page, pay attention! I put a couple of bars together backwards and it probably cost me an hour or so to figure out what went wrong and do it over again. Warning, I lost a few nails and got a very minor cut during the assembly process. 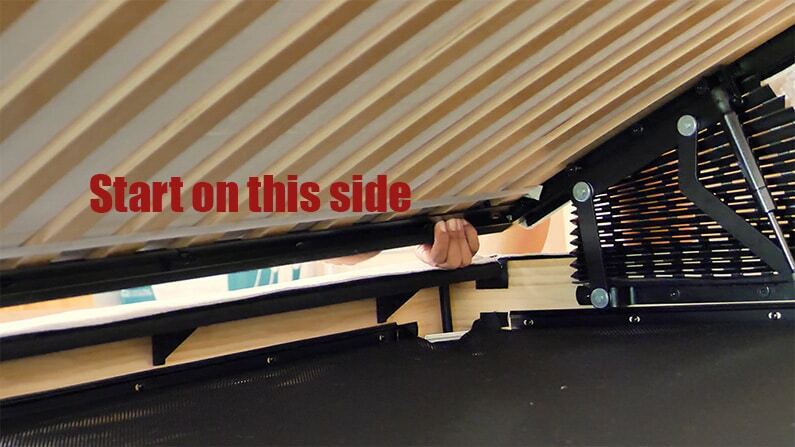 IT DOES NOT CLOSE UNTIL YOU PUT THE SLATS AND MATTRESS ON IT. If you try to close it you may break it. Here is a huge time saving trick for you. When the couch is open to reveal the storage section it is important to start putting the mesh storage layer on in the mouth of the long side of the Flottebo. The reason for this is that the space is tight so it is hard to work your fingers around in that area. You will find that it is much easier to maneuver and stretch both this mesh and, later on, the cover on the other three sides. How BIG is the Flottebo? IKEA offers an amazing 365 day trial period. If you don’t like it and it isn’t found to be dirty, stained, damaged or abused they will give you a full refund. No, I would argue that it functions just as well as a bed as it does as a couch. Yes, you could switch colors by buying a new set of pillows/cover. How long have you had the Friheten? I purchased it in October of 2018. No, you don’t sink into it that far so heat doesn’t seem to get trapped inside the couch. After owning both of these IKEA couches for over 100 days I decided to put together a video about the differences between the two. Here are my thoughts and below is the video of both of them. You might find putting the Flatebbo together easy, to me it was not. It took me over 4 hours, a few broken nails and some bruises. There were a couple of steps where I messed up, but it was a great moment once I was done putting it together. I could tell instantly the sofa’s material is pretty decent, and the cover is easy to clean since it’s removable and machine washable. I decided to cover it to keep it clean as much as possible. I am not ready mentally to remove it and put it again. What’s cool is that you have the choice to change covers thus colors! The sofa quickly and easily transforms into a spacious bed. The large storage space under the seat has plenty of room for things like bedlinen. On the underside of the back cushions is an anti-slip material that prevents them from sliding. You can lean on them or lift the mattress to access the storage space without them moving around. You can angle the side table in different directions and adapt it to suit what you’re doing, whether it’s answering e-mails or eating popcorn and watching a movie. You can place the table by any of the sofa’s corners to suit you and your home best. How do I buy an IKEA Flottebo? If you live by an IKEA you can pick one up in store. It has 4 boxes that weigh a bit more than 200 pounds total. It will easily fit into a truck or large suv, but I don’t see how it would fit into a sedan. Your other option is much simpler, just log on to IKEA’s site and search for the Flottebo or sleeper sofas. For a dual purpose couch and bed it is going to be difficult to beat this price. I was really tempted to pay the extra $100 for the green, but I didn’t think it would go with my living room. Please ensure someone over the age of 18 is available at the delivery address to accept the order.